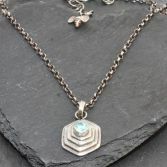 Topaz Pyramid Pendant is made using a solid Sterling Silver hexagon pyramid which has a dimpled texture and a stunning 5mm Sky Blue Topaz Gemstone. 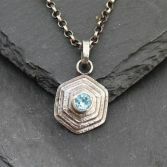 The pendant measures 17mm at widest point and 27mm length including the bail. 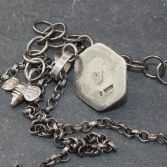 The chain is a strong belcher chain with links that measure 2.4mm by 3mm. 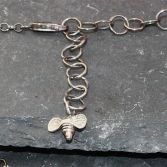 The length of the chain is 16 inches but it can be worn from 16 inches to 18 inches as it has a pretty looped 2inch extension chain. 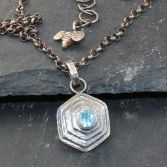 At the end of the extension chain it's finished with my signature little Bee which hangs down your back and is also made of solid silver. I have only made one of this pendant and have given it an Oxidised blue black finish which gives it a moody contemporary look. However if you would like a different finish or a different gemstone then please do email me your requirements at julie@juliebrandonjewellery.co.uk i can always make another one to your specification. 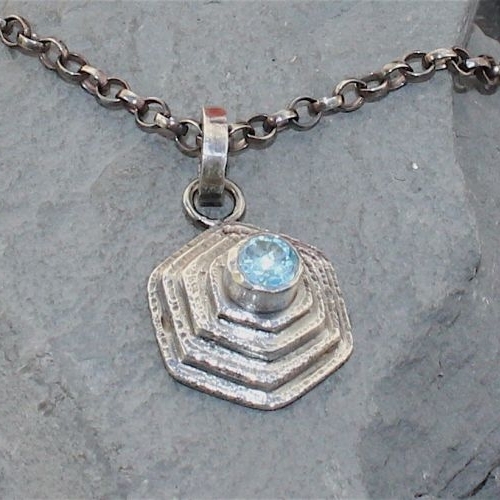 The Topaz Pyramid Pendant has full UK hallmarks stamped at an official Assay Office. 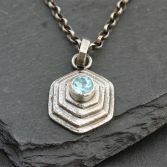 Your Topaz pyramid Pendant will be placed in a gift box and padded envelop and posted via Royal Mail 1st class (signed for) delivery to any UK address free of charge.